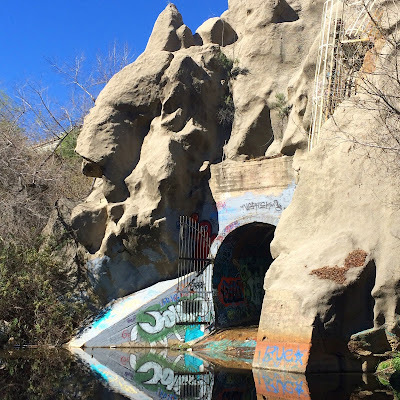 “Devil’s Gate is named for the appearance of a horned devil face in the narrow canyon of the Arroyo Seco, a natural riverbed flowing from the San Gabriel Mountains into Los Angeles basin” (LAGP). This dam is located beneath Suicide Bridge. It was built around the 1920’s to modify the water flow through the Arroyo Seco in Pasadena, CA. This was the first control flood dam in Los Angeles County. There is an urban legend behind this mysterious dam. Since the Devil’s Gate Dam, Cobb Estate, and Suicide Bridge are all connected by points, they named it the Arroyo Triangle. It is believed to be one of the seven portals to Hell. People claim that the portal was opened by three occultist scientists. Jack Parsons , Aleister Crowley , and L. Ron Hubbard all believed that this Devil’s Gate had some sort of magical energy that could give them power. The three performed rituals that were believed to go along with their project. They referred to this as their Babylon Working. “Babylon Working is a summoning of an entity known as Babylon that would aid then in the creation of an ‘anti-christ’, a child who would eventually destroy mankind” (Marie). But, a few years later, Parsons, Crowley and Hubbard’s friendship died down and they went their separate ways studying in their own perspectives. Parsons died in 1957 due to an unexplained explosion in his home laboratory. A few years later, several children went missing around the Devil’s Gate area. Two of the missing childrens’ mysteries were solved by uncovering their bodies buried from a killer who was discovered around the area. The other missing children were never found. People believe that they were dragged into the portal and can not get out. A special paranormal activist group who especially believes this mystery are the Paranormal EXP. They visited Devil’s Gate Dam back in 2011 and got first hand voice recordings of a little boy stating his name as ‘Tommy’. There are many people who believe in this paranormal portal to Hell and think it is true. It dates all the way back to the Native Americans believing this dam was haunted and forbade anyone to go there. Along with that, there are also a handful of people who do not believe in any of it. Even with all the evidence. I feel those people do not want to admit that they maybe a little believe in the Devil’s Gate because they are just not sure whether to believe or not. I guess it is up to you, do you believe in ghosts or portals to Hell? I feel you should go visit Devil’s Gate Dam for yourself and then answer that question. Anderson, Donna. “Is Devil’s Gate Dam in Pasadena a Portal to Hell?” examiner.com. N.p., Aug. 11, 2012. Web. Oct. 12, 2015. Kreuzer, Nikki, “Devil’s Gate Dam”. Photograph. LABeat. LA Beat. 25 Feb. 2015. Web. 15 Oct. 2015. Los Angeles Ghost Patrol. “Devil’s Gate: A Portal to Hell?” laghostpatrol.com. Sayontan Sinha, May 18, 2011. Web. Oct. 6, 2015. Marie, Kelly. “The Story of Devil’s Gate Dam.” Definenormal.org. N.p.,Sep. 22, 2012. Web. Oct. 12, 2015. Paranormal EXP. “Devil’s Gate Dam-Pasadena, CA.” paranormalexp.com. July 8, 2011. Web. Oct. 12, 2015. S.I.U. The Supernatural Investigation Unit. “Devil’s Gate Dam Pasadena/LA Canada, CA” hauntedlosangeles.blogspot.com. N.p., Feb. 28, 2014. Web. Oct. 6, 2015.